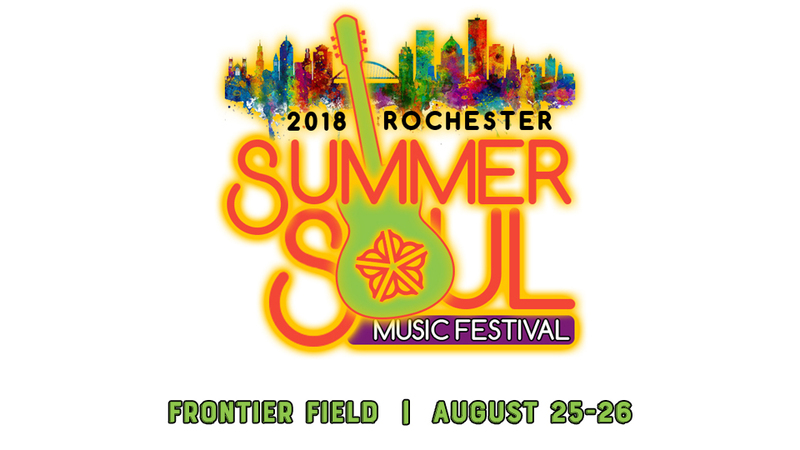 The new Rochester Summer Soul Music Festival will take place on Saturday and Sunday, August 25 - 26, 2018 at Frontier Field! Xperience Live Events, LLC, a Maryland-based events planning company founded by Rochester native Varick Baiyina, has been selected by Mayor Warren to serve as the new promoter of the festival. The company's vision is to build the Rochester Summer Soul Music Festival into a premier community event that will have regional appeal, and will also spur economic growth within the city of Rochester. Xperience Live is currently lining up headline entertainment for the two-day festival. The company is pleased to announce that two major recording acts have been secured thus far: Morris Day & The Time, and George Clinton & Parliament Funkadelic will both perform on Sunday, August 26. Negotiations with additional acts for Saturday and Sunday are currently underway and will be announced over the next several months. There is a tiered ticket structure for the Rochester Summer Soul Music Festival. Per day ticket prices as of May 1 are as follows: general admission tickets are $40.00, field access standing tickets are $75.00 and VIP seating is $120.00. Early bird ticket prices will be in effect March 15 - April 30. Early bird per day tickets can be purchased for $30.00 general admission, $60.00 for field access standing and $90.00 for VIP seating. The two-day/combined package price is $55.00 general admission, $125.00 for field access standing and $175.00 for VIP seating. "I am truly excited to launch the newly revamped Summer Soul Music Festival this year," said Rochester Mayor Lovely Warren. "The changes we're making will definitely enhance the experience for festival goers, and will be a wonderful way to wrap up our summer season. I look forward to working with Varick Baiyina and his team at Xperience Live to produce the type of festival that our residents, and people from all around our region, will look forward to attending every year." While the Rochester Summer Soul Festival will remain an R & B/Soul music focused festival like its predecessor, a number of changes and enhancements are being implemented. Topping the list of changes is a move to the month of August. Historically held in July, the move to August will allow Summer Soul Fest to serve as the season finale following a number of culturally rich events, including the Clarissa Street Reunion, Carifest, and the Afrikan American Fest. A free community block party component has also been added to the festival. The block party will take place at Frontier Field as well, directly outside the stadium in an adjoining parking lot, and will feature a community stage, music, children's activities, a health zone, local vendors, food trucks, and other activities. "We want the Rochester Summer Soul Festival to be a true community event," added Mayor Warren. "And as such, we wanted to make sure that everyone would be able to come out and enjoy some of the activities. The block party will allow anyone who wants to be a part of the fun - - young, old, and in-between - - to hear some good music, have access to various family activities and entertainment, and to simply enjoy socializing and being a part of our community." Updates on the Rochester Summer Soul Music Festival can be found online at rocsummersoulfest.com.